1951 Staged a flower show at the University of Washington Pavilion.... Seafair that year featured first night Torchlight Parade since before World War II years..... National Figure Skating Championships held at Civic Ice Arena.... General Douglas MacArthur arrived to signal beginning of Seattle's Centennial celebration.... Musicals included "Student Prince", "Blossom Time", "H.M.S. "Pinafore", and "Rose Marie".....First Gold Cup was held on Lake Washington with Slo Ho V winning. 1952 Seattle Centennial celebration in full swing.... Greater Seattle inaugurates "Welcome Lane" for servicemen returning from Korea. Hundreds of thousands of troops hailed with dockside welcomes and "ticker-tape" parades up downtown Seattle streets.... Jose Iturbi is featured in summer concert.... Shows included "Die Fledermaus", "Roberta", and a Cole Porter Concert.... Slo Mo IV wins Gold Cup races on Lake Washington. 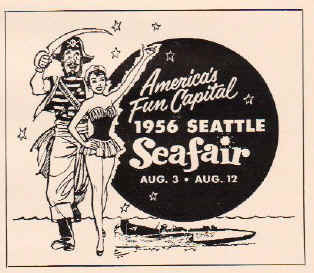 1953 National Governor's Conference is held in Seattle.... President Eisenhower visits.... Navy sends 40-ship Navy Task Force to Seattle for Seafair, including 15,000 men and officers..... National swimming figure, Ann Curtis, is star of Aqua Follies..... Summer shows feature "Carmen", "Kiss Me Kate", "Finian's Rainbow", and Kern-Hammerstein concert.... Slo Mo IV repeats as Gold Cup winner on Lake Washington.....Torchy Torrance becomes president. 1954 Greater Seattle brings American Bowling Congress and estimated three million dollars in trade to Seattle.... Battleship Missouri and aircraft carrier Franklin Delano Roosevelt visit Seafair..... Welcome Lane greets the United States Army's 2nd Division home from Korea.... Summer shows feature "Oklahoma", "Student Prince", and "Carousel"0....Gold Cup is won by Slo Mo V on Lake Washington. .....Emperor Haile Selassie of Ethiopia welcomed to city. 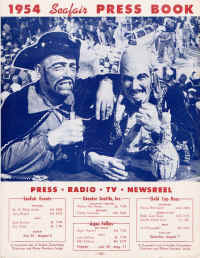 1955 Greater Seattle brings first modern-day pro-football game to Seattle with San Francisco 49ers meeting New York Giants in the University of washington Stadium before 48,000 fans..... Aircraft carrier Midway visits Seattle..... Summer musicals presented "Annie Get Your Gun", "South Pacific", and "High Button Shoes"..... Seattle lost Gold Cup back to Detroit when Gale V won the race on Lake Washington..... However, Grerter Seattle began drive to raise money for first Seafair Trophy race..... Jerry Bryant named president. 1956 First Seafair Trophy race with purse of $25,000 was held on Lake Washington and was won by Shanty I representing the Seattle Yacht Club.... Meanwhile, Miss Thriftway brought the Gold Cup back to Seattle by winning the Cup on the Detroit River.... Vickie Manolo Draves, Olympic Games diving ace, was star of the Aqua Follies..... The pro-football game at the U. of W. Stadium featured the New York Giants and the Los Angeles Rams.... Summer shows featured top Broadway stars for first time as Edie Hayes starred in "Call Me Madame" and Constance Carpenter and Leonard Graves played in "The King and I".....Stanly Donogh elected president. 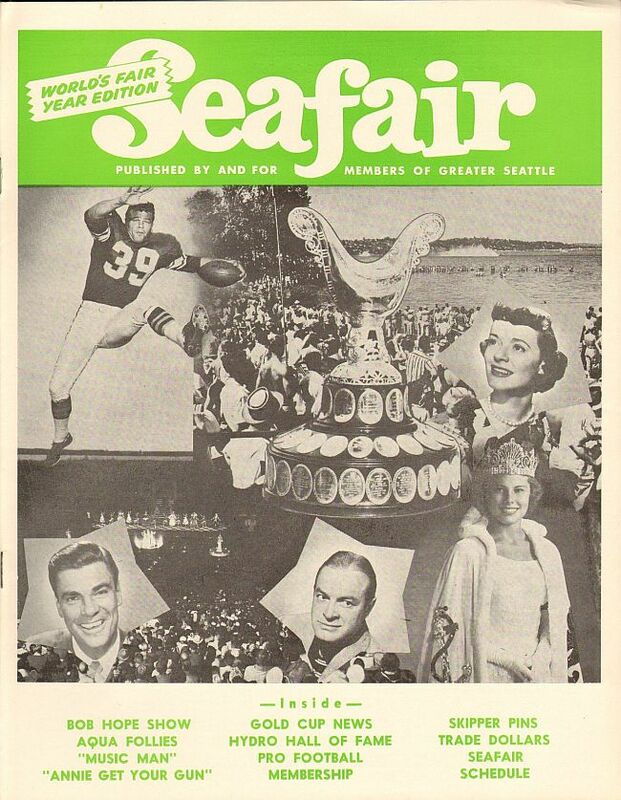 1957 Bing Crosby, Phil Harris, and Ed Crowley were honorary grand marshalls of the Seafair Parade, while Arthur Godfrey originated his radio show from Seattle during Seafair..... The pro-football game pitted San Francisco 49ers against Chicago Cardinals..... Miss Thriftway won the Gold Cup for 2nd successive year, this time on Lake Washington.....Gretchen Wyler starred in "Damn Yankees" and Martha Wright and Gene Hollman were featured in "South Pacific"..... E. L. Elaine elected president. 1958 Mr. and Mrs. Bob Hope served as honorary grand marshalls of the Seafair Parade.... Los Angeles Rams and Chicago Cardinals met in fourth pro-grid game at U. of W. Stadium.... Hawaii Kai III won the Gold Cup race on Lake Washington.... Pamela Britton and Oggie Small were stars of musical "Guys and Dolls", while Terry Saunders, Jim Hawthorne, and Bill Smith sang in "Showboat".... Colombo Conference brings officials of 21 pacific-rim nations and President Eisenhower to city for Greater Seattle welcome. 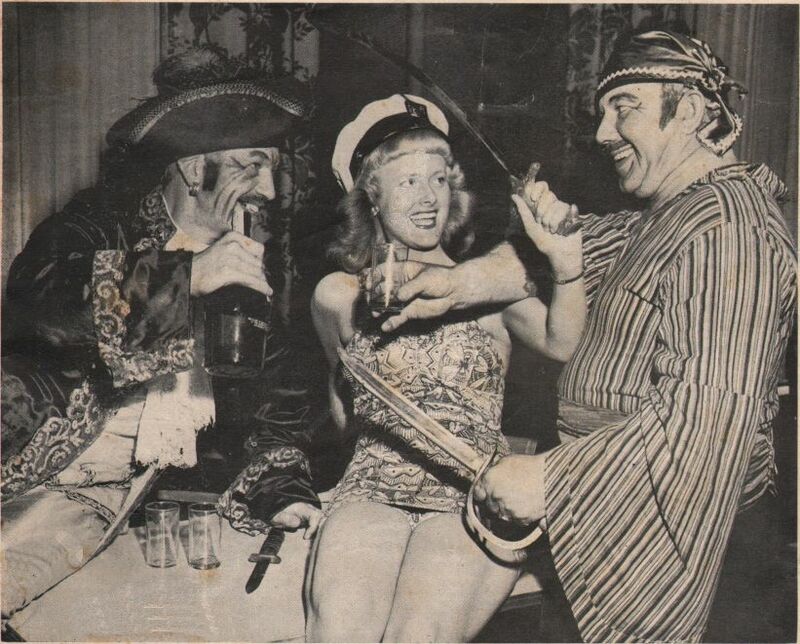 1959 Bob Hope, Phil Harris, and Bing Crosby were honorary grand marshalls in the Seafair Grande Parade.... USS Yorktown led fleet in for Seafair, while another visiting craft � Maverick, driven by Bill Stead � won the Gold Cup race for unlimited hydros on Lake Washington.... The Chicago Cardinals topped the San Francisco 49ers, 27-24..... Aqua Theatre summer shows featured Pamela Britton in "Bells Are Ringing," and Martha Wright and Gene Hollman in "Most Happy Fella," as well as a one-night concert of Lerner-Loewe music..... Pan-Am games star Lynn Pawson headlined Aqua Follies.... George Kachlein served as president...�.Seattle P-I Sports Editor, Royal Brougham, named first recipient of Greater Seattle's "First Citizen in Sports" Award. 1961 President Kennedy visits�given Greater Seattle welcome.... Canadian Pro Football made its debut in Seattle as Vancouver, B.C., Lions beat Saskatchewan Roughriders, 13-3.... Revolutionary plan for hydro racing introduced by veteran referee and Greater Seattle, Inc., official Stanly Donogh, which resulted in $4O,000 World's Championship event on Lake Washington..... Miss Bardahl copped title, as Miss Madison won Seafair Trophy and Fascination cornered Queen's Trophy.... In Aqua Theatre, John Raitt played opposite Pamela Britton in "Oklahoma", which T. V. comic, Jan Murray, scored in "Silk Stockings"..... Joaquin Capilla, Olympic Games Swimming Ace, starred in Aqua Follies..... Gar Wood, Jim Spinner, and Jack Regas named to Hydroplane Hall of Fame.... Seattle Times Associate Sports Editor, George Varnell, named "First Citizen in Sports".....Dallas Donnan named Greater Seattle President. 1962 Greater Seattle's contribution to the World's Fair scene was an entertainment-packed year topped by the $100,000 Bob Hope Show at the Aqua Theatre. The show biz spectacular included Juliet Prowse, Jimmy Rodgers, the Fairmount Singers, and the Marquis Chimps... it was a smash sellout.... Gisele McKenzie returned to do "Annie Get Your Gun," and video personality Bert Parks won acclaim for "Music Man".... Bill Muncey copped the Gold Cup unlimited hydro race, while the San Francisco 49ers were too much for the Minnesota Vikings in the pro football classic.... Greater Seattle, Inc., co-ordinated the nationally-recognized Plaza of the States programs, in which all 50 states were saluted at the World's Fair, and participated in the successful Trade Dollars souvenir promotion.... Seattle Fire Chief, William Fitzgerald, named "First Citizen in Sports" by Greater Seattle.